I'm planning to ask for Christmas to be offered an SBC. As you can guess by the title, I have a huge hesitation between Rpi 3B+ and Asus TB. I would like to get a SBC to try some software stuff, installing various Linux distribution, making tries over this, developping a bit of Python, and doing a bit of retrogaming. So what can you tell me about this ? Do I really need the power of Asus TB ? Or is Rpi 3B+ enough ? The fact that you have to ask this question implies that you are new to SBC's and Linux. Given that, you are far far better off with the Raspberry Pi as the support and infrastructure are in a different league. Get the latest 3B+ model (make sure it is the "plus" version). It is easily powerful enough for what you want. Start with Rasbian, learn your way around, and then try other distro's or OS's. You can of course keep multiple micro SD cards, so you can try different distro's (including 64-bit ones which the ASUS cannot run) while retaining a working Raspbian install. Last edited by jahboater on Fri Dec 07, 2018 9:57 am, edited 1 time in total. I'm quite new on SBC, but not on Linux, that I'm using for years now. I began on Mandrake a looooong time ago, and worked a bit with Debian/OpenSuse/Fedora during my studies, finally opting for Ubuntu for my old Laptop now. Thanks for your answer ! Like Ubuntu, Raspbian is based on Debian, so you should find it familiar. The tinker board is uses the Cortex-A17 cpu which is ARMv7 and 32-bit only. Will tell you soon if this becomes real. Any other reply is (of course) welcome ! The nearest to a Raspberry Pi in terms of support and quality are Hardkernel Odroid range. Yes Odroid seems good too but no built in wifi or bluetooth from what I saw. The RPF even offer Debian Stretch with "Raspberry Pi Desktop" for x86 Architecture Machines ! Last edited by hommar on Fri Dec 07, 2018 5:26 pm, edited 2 times in total. The RPi 3B+ is more than enough. While the tinkerboard does have more and faster memory, that is about the only significant pro in its favor. While I have not looked in detail, the Asus site sais that the tinkerboards GPU is fixed function (that is early 1990's way of doing a GPU), which would mean that the VideoCoreIV of the RPi 3B+ is quite a bit better. I can not speak for the merrits of the CPU, as I can not quickly find any realworld performance information (would have to take some time to research that). Though the RPi 3B+ ARM Cortex-A3 quad core CPU performs quite well, and in most applciations the memory speed difference is not going to be that big of a thing, because most things are sped up by the ARM's L1 and L2 cache. Just a quick responce, having taken all of 3 minutes to research the Asus Tinker Board. I use a Raspberry Pi 3B+ as my primary computer, and am typing this on the Raspberry Pi 3B+. Also the Asus board is not on the list of systems that can run RISC OS, so that is a loss for the Tinker Board. RPi = Way for me to have fun and save power. Household TTL Electricity Usage = 1.4KW/h per day. 500W Solar System, produces 2.8KW/h per day average. Thanks everybody. Looks like you've been convincing. And Aldo did the price of the thing. So it will be a Pi ! I have several Pis and did have some fun going thru the exercise of installing a couple "officially supported" and non official distributions during my "lets check stuff out phase". In the end, overall... the standard Raspian/Raspian-lite are optimal and best choice for most purposes... but with that said, if you have specific needs etc... there are several non Raspian distros that work very well on the Pi and have focus on specific uses. I use Arch exclusively these days on my normal PCs and Laptops and since I am very comfortable with it I do have/keep a Pi Zero running Arch... its with the Pi Zero that I actually found it sorta useful to keep something like Arch running on it. Raspian-Lite is very lean and by default so is Arch.. as in it starts with the bare minimum and its just up to you what you install past the bare necessities. From my comparisons, base Arch-ARM with wiringPi and some other libraries to do things... the disk and mem usage is (if you want to pick at straws) just barely less than a base Raspian-Lite instance... so when you need something very lean like you typically would need on a Zero.... those two work very well. I don't know much about web browsing on a tinker board, but chromium on the Raspberry Pi can become a memory hog if left open for couple of hours. I usually close chromium then reopen it 10 seconds later. Clears the memory up. I also use a small tweak, its basically compressed memory which helps quite a bit on high memory applications, aka chromium. 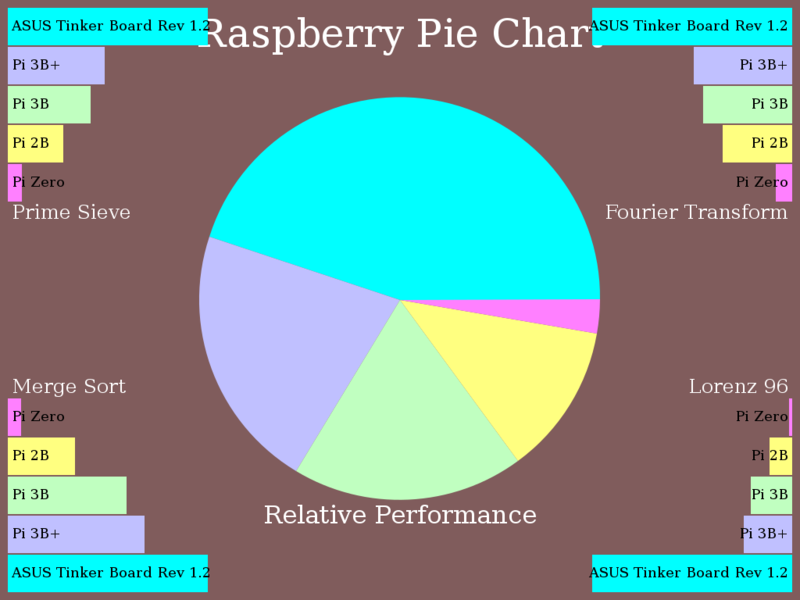 An easy way to compare the performance of the CPU on the Asus Tinker Board with the entire line of Raspberry Pi products would be for someone with a TB to download the Pi Pie Chart program available here, then compile and run in on the Tinker Board and report the results. Does someone here have a tinker board to give that a try on? I do and it's a delightfully speedy little desktop replacement. Much faster than my Pi's. If it wasn't for the almost non-existent support. I would use it more than my Pi. Getting the GPIO to work on a tinker board is a nightmare. I'll try that out later today, but it'll be at least 12 hours from now. @OP, get a Pi3b+ - it's good enough for what you want. Google is ubiquitous - Try it today, it's free! I also have a TB, and as Imperf3kt said, lack of support is what kills it. In synthetic benchmarks the TB clobbers the Pi3B(+), but in real world use that advantage isn't always realized. I've had a lot of performance and stability issues with the TB, while my Pi3 computers just work. As one example, I tried to move my Minecraft SMP server from a Pi3B to the TB, because the TB has a faster SoC, twice the RAM, and dedicated gigabit Ethernet. I fully expected the TB to outperform the Pi3B handily, but in reality it was very laggy, and I could never figure out why (due to the lack of good support). Everyone on my server agreed that gameplay was better on the Pi3B, so the TB went back to collecting dust. The hardware is great, but TinkerOS is a steaming pile of poo. There is little in the way of support from ASUS, who can't even be bothered to make a support forum (the one that exists is actually from a dealer). The apply named Tinker Board will require a great deal of tinkering on your part, before you can even start using it, so if you are not very experienced with Linux and single board computers, do yourself a favor and get a Raspberry Pi3B. While it is not as fast as the Tinker Board, the Raspberry Pi3B is a superior product with great support and a stable, functional and highly polished OS. Raspbian is lightyears ahead of TinkerOS. Oh, and if you want to try out different operating systems, get the older Pi 3B model, because a lot of the 3rd party operating systems have not been updated to support the newer models (3B+/3A+), which require a new kernel and firmware. lots of pop-ups...and where is that annoying music coming from? Do remember HawaiianPi, you can install Android 6.01 on a Tinker Board, and it's generally much more suited for a media centre only build than Raspbian. Anyway, since it was requested, a Pichart created for an Asus Tinker Board revision 1.2 (the original Tinker Board) with a fresh install of the unofficial TinkerOS 2.0.4 (from several months ago) on a Lexar 633x MICROSDHC UHS-I class micro SD card using the official Raspberry Pi power supply and a wireless keyboard and wireless mouse. Additionally, I was not using the stock heatsink, instead using a 22 cubic mm aluminium heatsink with a 40mm fan which automatically scales speed based on SOC temperature. I used the base settings, I did not adjust anything from the downloaded source files. During the test, the temperature rose from about 35 degrees, to 45 on average, and 55 during the Lorenz test. Ambient temperature here is 24 degrees. Last edited by Imperf3kt on Tue Dec 11, 2018 1:07 am, edited 3 times in total. It is more than just the great "support" the Pi has, and the other SBC's do not have. If the OP looks at the likes of The PiHut, Pimoroni, ModMyPi etc etc there is a whole industry selling countless tempting and fun add-ons. For web browsing / chromium the Tinkerboard is far faster and more useable than a Pi3. 2GB RAM makes the difference - it's actually my daily PC, and same SoC is used in chromebook flip / chromebit. The pi obviously has a much bigger community, and more maker focussed. There is little in the way of support from ASUS, who can't even be bothered to make a support forum (the one that exists is actually from a dealer). Android app - Raspi Card Imager - download and image SD cards - No PC required ! Let's start with your questions and let's thes see which myths I see here and there..
Disclaimer: I own RPis and a tinker as well, my use-cases are mostly head-less scenarios where both, the Pi and the tinker wouldn't be my first choice (but that's a different story). I assume as long as web-surfing doesn't mean watch funny cats on youtube the tinker will outperform the Pi due to memory. The CPU is more powerful on the tinker (IMO 64bit doesn't matter as long as RPis default isn't 64bit, so most 'distros' for the pi will simply be 32bit as well). To watch high resolution videos on yt you need hardware accelerated decoding working with a browser something (to my knowledge) no distribution offers for the tinker at the moment. Hardware accelerated videodecoding for dedicated players works (at least with RKs 4.4 kernel). For the coding part.. as long as your favorite distribution offers the compilers (c++) or python it shouldn't be that much an issue on both SBCs. Most distros for both boards are debian based. So you'll get what you need here. There's a retropi image based on a 4.4 kernel based on a debian based OS I'm tied to. Cause my interests in this field is minor and I never tried it I can't speak how well it works and what you can expect. From what I heard it works without major issues but not my field, you've to do your research on your own. Most/all those people offering images for those boards are spare-time maintainers depends on their time and knowledge how fast *random feature* is supported. In synthetic benchmarks the TB clobbers the Pi3B(+), but in real world use that advantage isn't always realized. I've had a lot of performance and stability issues with the TB, while my Pi3 computers just work. The hardware is great, but TinkerOS is a steaming pile of poo. There is little in the way of support from ASUS, who can't even be bothered to make a support forum (the one that exists is actually from a dealer). The apply named Tinker Board will require a great deal of tinkering on your part, before you can even start using it, so if you are not very experienced with Linux and single board computers, do yourself a favor and get a Raspberry Pi3B. While it is not as fast as the Tinker Board, the Raspberry Pi3B is a superior product with great support and a stable, functional and highly polished OS. and for my use-case the tinker easily outperforms every Pi.. The tinker is prone for stability issues due to a IMO bad design decision (a powerhungry SoC combined with microUSB mixed with a small IMO useless heat-sink). Get it properly cooled with a decent PSU and most of the stability issues magically disappear. I don't know much about TinkerOS cause I don't use it but my tinker runs since months with a 4.14 kernel headless without any issues (there are some reboots due to kernel-upgrades but every reboot was planed..
Raspbian is lightyears ahead of TinkerOS. assuming you measure development in years and not in meters (or miles depending on country) a lightyear doesn't make much sense here..
as long as those distros still offer armhf packages 32bit vs. 64bit doesn't offer you a much bigger choice. Fact is, due to popularity you'll get more images from different distros for the RPi than the tinker. If this is a real benefit is a different question. IMO I prefer distros which cover more SBCs than many distros for one SBC... I don't want to spend ours just to figure out how *random topic* is configured in *random distro*. But as said to get an insight into different distros I would go for the x86 versions of them which are generally better maintained. both have their flaws it's not that the RPi is flawless... it depends which flaws you're willing to accept and which not. Powering can be an issue with the tinker, heat dissipation as well both aren't much an issue when kept in mind. well.. I'll disagree on this one. A more powerful CPU (in 32bit mode - as raspian uses their cores as well) and real GbE may also count..
double the memory doesn't count? interesting.. When recommending hardware to others 3mins of google might not be sufficient. hmm not really. there are a bunch of GPIO libs for the tinker which works without major issues. Even /dev/gpiomem (for rootless access to the needed registers in /dev/mem) instead of libgpiod or sysFS based ones..
And the tinker is 'more or less' pin compatible to the RPi with some efforts things can be used on the tinker as well. It just needs some efforts to get things working. The tinker offers more power, a faster SD-Card interface, more ram and real GbE. If more power is needed I would go for the tinker. The RPi offers a bigger community and probably various images etc. The Pi is cheap enough to give it a try. If you go for the tinker you should consider the TinkerS with eMMC as well as some of the 'design flaws' are solved as well. On the Tinker, what is the equivalent of "omxplayer" (in Raspbian) ? J lnacjrw njbruh-carppnanm vxm rb mnuncrwp vh yxbcb! Where does the extra RAM help when you are using less than 128MB maximum? The memory speed would help for some things. There are without question things that will benifit from faster RAM, though there are also many things that do not. Where is a good reference on programming the tinkerboards GPU? How do you boot RISC OS on the tinkerboard? These are questions that when answered may make the tinkerboard worth half a look as a desktop computer. Every person will have different needs. It will fill some needs of some people, and not of others. Please try to be unbiased when considering hardware recommendations. There is a 4k video player built in, but last I used it, it was buggy. On a personal note, omxplayer has never once worked for me for anything other than audio files. Infact, looking at the early builds of TinkerOS, one could assume it is actually directly based off Raspbian Wheezy, with Raspbian mentioned in several core files.